In this tutorial we are going to build our backend service using Vapor. It will be responsible for sending a notification to our iOS application. Sometimes sending notifications with only text just isn’t quite enough. This is where rich notifications come in. We can add images and videos to our notification to give the user a richer experience directly from their notification center. Now we will build your application before opening it in Xcode. Remember your first build could take some time to complete. Vapor update will make sure that you have the latest packages. Now we need to close Xcode and install the package and reopen it. It’s best practice in Vapor to create and install files outside of our Xcode project using command line tools and then reopen Xcode using the toolbox command. After closing Xcode run the following command in the terminal in our working directory. Log in or create an account to access your dashboard here. 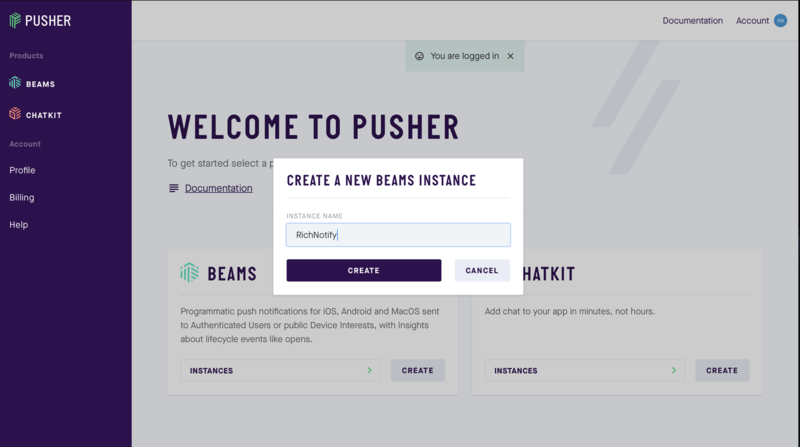 Create a new Beams instance using the dashboard. Rich notifications allow you to send different types of multi-media content. There are specific types of supported content that you can send. You can find up to date information on those content types here. You should also make note of the maximum size these files can be. We will be creating a simple application with one post request that we can use in order to send different push notifications using our REST client. We need to import the new PushNotifications dependency we have just installed. Here we create a new POST route that is capable of sending a specific push notification based on the data that is passed in using the wrapper class we have defined below. This is the structure that our post request is expecting the data to arrive in. This includes a string that contains the URL of the data that we want to show in our notification. This is our wrapper class. Here we create an instance of the dependency we have installed using the Beams instances ID and secret key you created earlier. We only have one interest in our app (which is general). We create a publish request using for APNS using the message that is passed in using the method call and we then publish this using our dependency. Make note of the "mutable-content" flag in the data structure, this will be intercepted by our notification service extension in iOS to display the data. Also make note of our "data" key that includes our data url. Our application will use this information in order to download the image or video that we have sent. Hit the run button in Xcode, you should see a message in the console saying it has started and is listening on http://localhost:8080. Leave this running in the background whilst you complete part two. We’ve learnt how to add a dependency the Beams server side SDK as a dependency to Vapor and setup a basic route that can publish notifications to an iOS app that has registered for the interest. We’ve learnt about the different types of rich push notifications that can be sent and their limitations. Now that you have a basic backend setup we need to go ahead and create the iOS application that can display these notifications. Stay tuned for part two!